By now you've seen a few Super Bowl items from us that don't actually have to do with who will win Sunday. 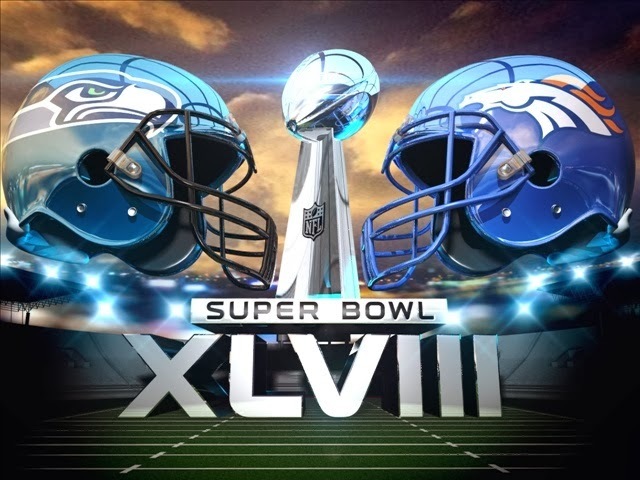 Tuesday, Joe brought you all the reasons why this year's Super Bowl will be one like no other. Wednesday, Jeremy brought you his STONE COLD LOCKS on who will score first in the big game, while Joe brought you the best Super Bowls in NFL history. Finally, Thursday brought prop bets from Jeremy, and a podcast on the game, plus the Wes Welker hate in New England, from Bob Lobel. Well, all the cute previews are done, because it's time to get serious. Who's gonna win Sunday, and how are they gonna do it? Find out below. "Pot Roast," as he is known to his buddies, was dominant against New England in the AFC Championship Game, turning Patriots running back LeGarrett Blount into a one-game playoff wonder. If he can even be nearly as effective in this game, it could mean a title for Denver. As efficient as Seattle quarterback Russell Wilson has been through the air and on the ground, everything the Seahawk offense does begins with Marshawn Lynch. If Knighton is able to clog up the middle, the Broncos will suddenly be able to keep guys like Shaun Phillips at home to defend Wilson's zone-read keeper, and play action becomes far less effective. It's a tall order, but if Knighton is able to dominate inside, he could be the most important defensive player in the game. The only matchups that it seems anyone wants to talk about are Denver's All-Pro receivers lining up opposite Seattle's All-Pro defensive backs. There is good reason for that, obviously, and I'm not here to say that people shouldn't be talking about it. But I'm of the opinion that it's Seattle's passing game and Denver's pass defense that will go further towards deciding the outcome of the game. Seattle's secondary is too good to be torched in the way Denver's offense is accustomed to. But at the same time, Denver's offense is too good to be completely shut down in the way Seattle's defense is accustomed to. What's likely to happen is that those two strengths make a zero-sum game, and it'll be an overall average game for Denver's passing attack. Seattle's receivers, however, aren't of the All-Pro caliber talent and production of Denver's, and the same goes for Denver's secondary in comparison to Seattle's. It's entirely possible that Tate and Baldwin could spend the entire game with nothing but green grass in front of them, just as it's entirely possible that Bailey and Rodgers-Cromartie could take them completely out of the game. If Tate and Baldwin have no trouble getting open, Seattle's offense will be exceedingly hard to stop, and they might even be able to keep pace with Denver's offense. If they can't get open, Seattle can't expect to score enough points solely on the strength of their running game. The guys calling penalties have a bigger impact on any game than we would like to admit, but the way they officiate this game could determine the outcome. Seattle's secondary is the best in football, and they've overcome some of the league's best passing attacks by doing one simple thing: Cheating. Well, it isn't cheating if it isn't called. The Seahawks have basically gone with the theory that refs will call pass interference when they grab and tug on receivers every now and then, but they won't dare call it every single time, for fear of "deciding the game." Well, the game's officials have heard that talk for close to two weeks now, so they have probably made up their minds on where the pass interference line is for Richard Sherman and Co. If the refs get itchy with the whistle early, it could mean curtains for Seattle, but if the Seahawks are allowed to play their game in chilly New Jersey, then we could see the Peyton Manning that we saw so many times against good Belichick defenses in the early-to-mid-2000s. The "Peyton Manning Cold" narrative, for the most part, is crap. The reason Peyton Manning's record in the cold isn't quite up to snuff has a lot more to do with the teams he was playing in that cold weather than the temperature on the field. The weather that could influence the game, however, is wind. Plain and simple, Manning's arm is not as strong as it used to be, and strong gusting winds have the potential to mess up the timing that the Denver offense is built on. The current forecast says winds are expected to be out of the West/Northwest (MetLife Stadium has a north-south alignment, so these would be sheering winds across the field), at speeds of about eight miles per hour. This likely isn't enough to greatly affect much. The Broncos-Patriots game from the regular season that saw Bill Belichick elect to take the wind over the ball in overtime saw steady winds of over 20 miles per hour with gusts up to 30. However, if winds start gusting (which is always hard to predict, unlike temperature or precipitation), Denver's offense could find themselves in a pickle. With the Broncos being favored overall, it makes sense that each Broncos window has better odds than the corresponding margin of victory for the Seahawks. With the line at Denver -2.5, the game is obviously expected to be close. If you buy into that, it might make sense to put some bets down on the first two lines (Broncos winning by 1-6 points) and the same lines on Seattle's side. The closer the game gets. the more I like the Broncos. I think their run defense, led by Knighton, will be able to at least contain Marshawn Lynch and the Seahawk ground game, while I believe the relatively calm weather will play right into Peyton Manning's hands. While I believe Richard Sherman is the best corner in football, and I think safety Kam Chancellor can shadow Julius Thomas reasonably well, I just don't see any answers for Eric Decker and Wes Welker out there, not to mention the underrated Denver ground game. Unless Cliff Avrill and the rest of the Seattle pass rush dominate this game, I think Denver scores in the high 20s, and I just don't trust Seattle to keep up once this game gets past three scores. The biggest weakness of the Seattle defense is in the middle of the field on first and second down. For the most part, they play a conservative defense, sitting back in Cover 3, knowing that they won't get beat deep and their pass rush will clean things up if the quarterback holds the ball for too long. They usually don't get too aggressive with blitzes and underneath coverage until third down. This is something Denver can take advantage of. They have two elite targets in the middle of the field in Wes Welker and Julius Thomas. On top of that, they can send Demaryius Thomas on a bunch of crossing routes and semi-legal pick plays to get him separated from Richard Sherman. They won't be creating big plays (unless they get a nice run after the catch), but they'll be staying ahead of the chains and moving the ball methodically downfield. What could throw a monkey wrench into this is Seattle's pass rush. Just like the Giants front four dominated the Patriots' offensive line in 2012 and 2008, Seattle's defensive front could take over the game and put Manning on his backside. Even without Ryan Clady, however, Peyton Manning has managed to stay upright - in the AFC Championship game against New England, he wasn't sacked and was knocked down only once in 43 drop-backs. Manning hasn't been as good against "big" blitzes (six rushers or more) since coming to Denver as you might expect, and has been especially poor when defenses blitz from the secondary, ranking 20th or worse in each of the last two seasons in yards per attempt against blitzing defensive backs (stats courtesy of Football Outsiders). However, Seattle isn't a team that wants to blitz from their secondary - doing so would pull their elite coverage unit out of coverage. The X-Factor for Denver is their own defensive front. Seattle's offensive line is rather abysmal, so if Terrance Knighton can stuff some runs, and Shaun Phillips can pressure Russell Wilson, that will take a lot of pressure off their back seven, and should be enough to send them to Disneyworld.